Chase Sexton showed the way for Wiseco riders at Muddy Creek, while Jeremy Martin suffered an unfortunate injury that put him out for the remainder of the season. In the 450s, Ken Roczen nailed both holeshots and earned a solid 4th on the day. Read on for details and an injury update! 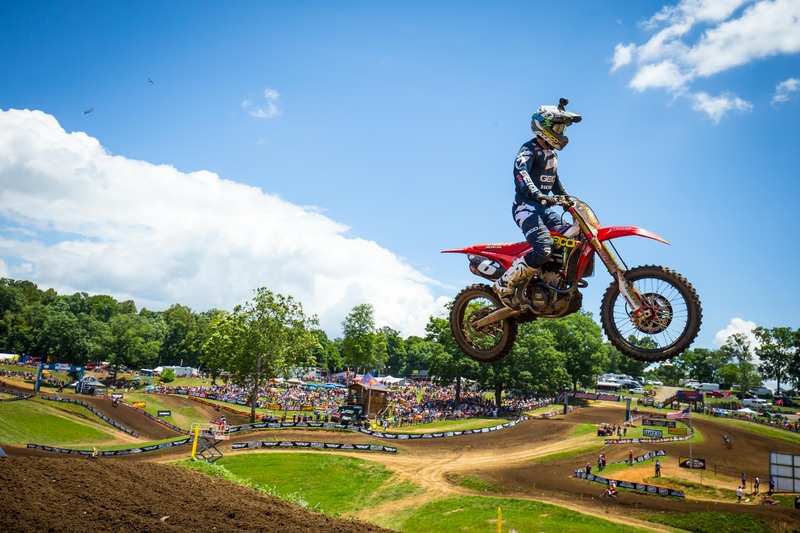 MENTOR, Ohio – Round 5 of the 2018 Lucas Oil Pro Motocross Championship proved to be a mixed bag for Wiseco-sponsored riders when the series made its annual visit to Muddy Creek Raceway in Blountville, Tenn., on Saturday. 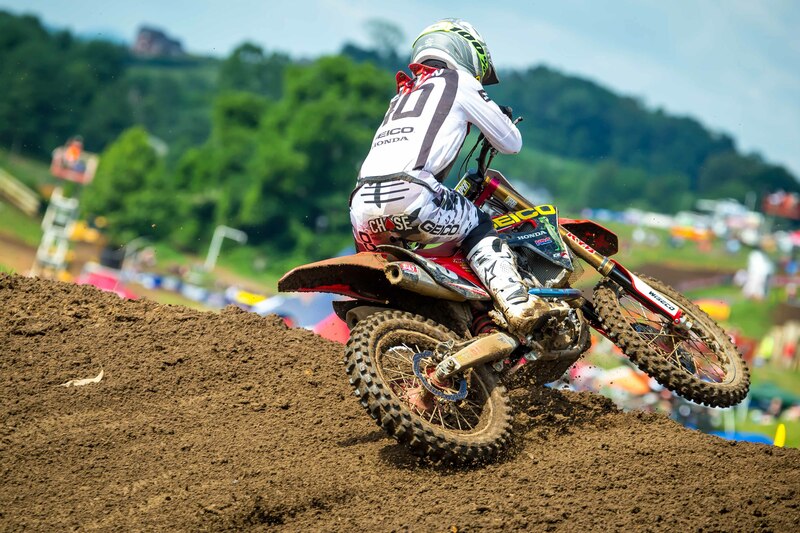 GEICO Honda’s Chase Sexton led the way for Wiseco’s 250 Class contingent where the 18-year-old rider turned in his first career podium finish in Pro Motocross competition. Unfortunately, the team was also dealt a devastating blow to its title hopes when Jeremy Martin was collected in an incident during the first lap of the second moto, leaving him with extensive back injuries, thus ending his bid for a third 250 Class outdoor title. Martin, who won the first moto of the day and was the points leader coming into the weekend, was diagnosed with a burst fracture of the L1 vertebrae and underwent surgery Monday. The rider of the No. 6 Honda CRF250R is expected to make a full recovery. Martin suffered an unfortunate, season-ending injury at Muddy Creek. Luckily, he has already undergone surgery and is expected to make a full recovery. Our best goes out to J-Mart! Sexton was fourth and fifth, respectively, in each of the 250 Classes qualifying sessions and was a fixture inside the top 10 all afternoon. The La Moille, Ill., native rounded the first corner of the first moto 10th in the running order and picked up a pair of spots over the course of the 30-minute-plus-two laps opening moto to earn a solid top-10 showing. Back on the gate for the second moto, Sexton bettered his first start by three positions and worked his way as high as third, but slipped to fourth. He closed out the day with a solid 8-4 result to be credited with a third-place overall finish. Sexton charged hard and rode consistent through each moto, rewarding him with a spot on the podium. 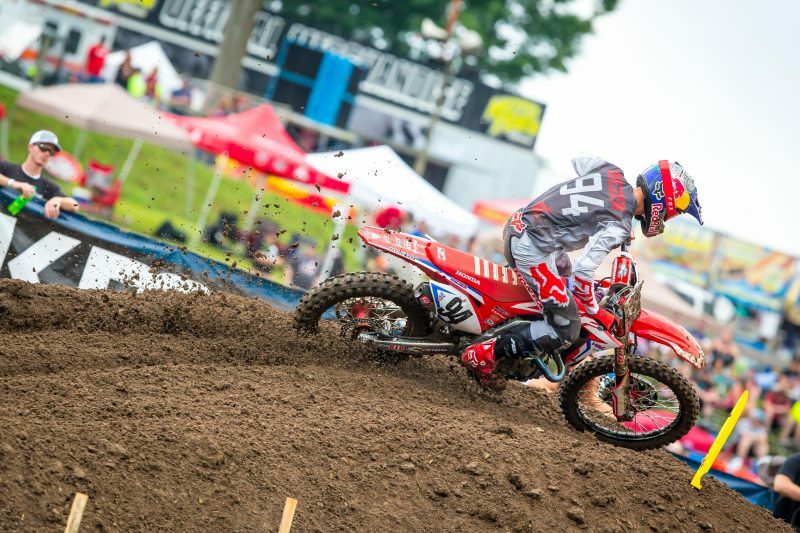 In 450 Class action, Team Honda HRC’s Ken Roczen led the charge for the Wiseco brigade. Roczen, a 24-year-old, two-time Lucas Oil Pro Motocross titlist, ripped a pair of holeshots and turned in a sturdy 3-4 effort on the day, good enough for fourth, overall. Ken Roczen, still working on getting back to 100% after injury in Supercross, put down an impressive performance, walking away with two holeshots and a fourth overall. The Lucas Oil Pro Motocross Championship returns to the Wick 338 in Southwick, Mass., this weekend for one of the most unique and grueling contests on the summer schedule. The first moto of Round 6 from the Southwick National will be televised live on MAVTV Sat., June 30 beginning at 1 p.m. Eastern Daylight Time, 10 a.m. Pacific. Broadcast coverage for the second motos will be televised on a live-to-tape basis on NBCSN at 8 p.m. EDT, 5 p.m. Pacific.